1. Trade war fears: The Trump administration must soon decide whether to impose tariffs on steel and aluminum products from the European Union, Canada and Mexico. The decision on whether to extend tariff exemptions could be announced as soon as Thursday, according to media reports. Moving ahead with the metal tariffs would escalate trade tensions, and potentially spark retaliatory measures. The European Union and Canada have both pledged to strike back. The United States is juggling potential trade conflicts on several fronts. The Trump administration announced Tuesday it would impose tariffs on $50 billion worth of Chinese goods and restrict Chinese investment in the United States. 2. Roller coaster in Italy: Investors are trying to get their heads around the latest drama in Italian politics. The main stock market in Milan has bounced back after days of heavy losses. Yields on government bonds have also dropped, indicating that investor fears have subsided. However, investors remain worried about a populist government or new elections that could boost euroskeptic politicians. The rest of Europe is worried about contagion. "A debate is raging in Brussels over whether the European Union should 'do a Brexit' and let the Italian situation resolve itself, or intervene to try and influence the outcome of the potential early election," Eurasia Group analysts wrote in a research note. 3. Softer US banking rules: Regulators unveiled the first rewrite of the Volcker rule on Wednesday. The post-financial crisis regulation bars banks from making risky trades with their own money, including customer deposits. Fed Chairman Jerome Powell said in a statement that the proposed change would strike at "some of the uncertainty and complexity that now make it difficult for firms to know how best to comply, and for supervisors to know that they are in compliance." Most major European and Asian markets posted gains. 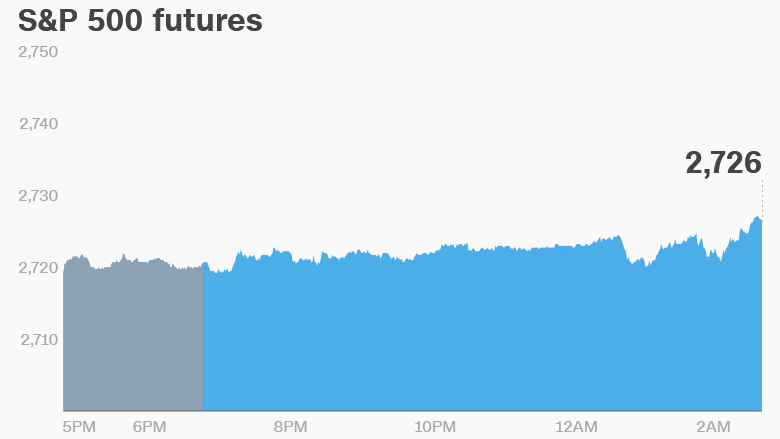 The Dow Jones industrial average and the S&P 500 closed 1.3% higher on Wednesday, while the Nasdaq added 0.9%. 5. Earnings and economics: Dollar General (DG), Dollar Tree (DLTR), Express (EXPR), and Sears Holdings (SHLD) are set to release earnings before the open. Costco (COST) and lululemon athletica (LULU) will follow after the close. Facebook (FB) is scheduled to hold its 2018 stockholder meeting on Thursday. The company could face tough questions from investors following its privacy scandal. The US Bureau of Economic Analysis will release personal income and spending reports for April at 8:30 a.m. ET. The weekly report on US crude inventories will be published by the Energy Information Administration at 11:00 a.m.
Eurozone inflation data for May is out at 5:00 a.m. Canada's first quarter GDP figures will be published at 8:30 a.m.